The mighty hand of the free market is forcing Lincoln to further branch out from its Ford roots, and this, the 2017 Lincoln MKZ, is its first, well, not a foray into the independent wilderness, but a peek out through the curtains. It looks a lot like the Lincoln Continental concept we saw a little while back, and it’ll be available with a unique-to-Lincoln twin-turbo, 400-horsepower, 400 pound-feet of torque V6. 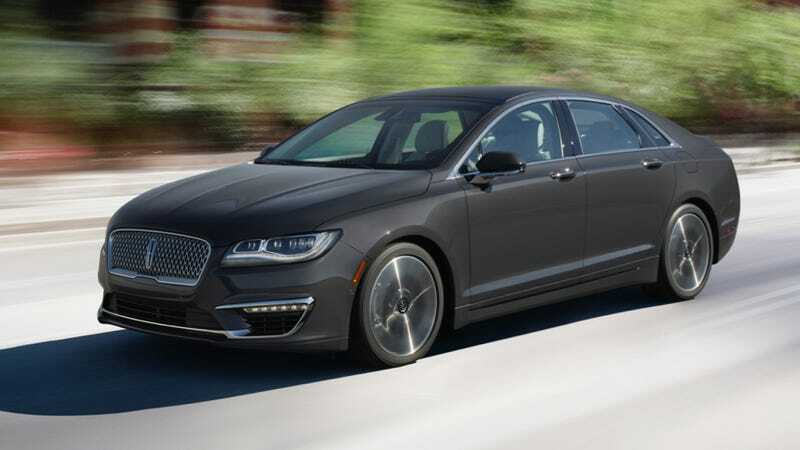 This is usually the spot in which I pontificate on the profundity of the vehicle’s profoundness, or something, but the truth of the matter is this a Lincoln MKZ and it actually sort of looks like a near-competitor, the Chrysler 200, with the back half of a Lincoln MKS grafted on. Carmakers tend to tout big new features about their vehicles in official unveilings, too, but at the moment Lincoln is sticking to the fact that this car is available with radar-guided cruise control, automatic park assist, and an auto hold button, which I am genuinely excited about because an auto hold button is the most underappreciated of all car features everywhere, FACT. But lots of cars have those things already. Those aren’t exactly Earth-shattering. There is, however, one feature I am in love with, that no other car in this universe has. Awwww yeah, that’s an X-chromosome if I’ve ever seen one. You can literally see the genetics of the car, this time. Anyways here’s a crappy photo of the car that I took with my phone so you can see it in the flesh. We forgot to send our real photographer to this because the Alfa Giulia thing was going on at roughly the same time, and Lincoln MKZ. Sorry, Lincoln.